What started as a way to involve my own adopted children with exposure to their birth culture has lead to even greater community involvement, where AWOL Tour guests can now join a community guided hikes. 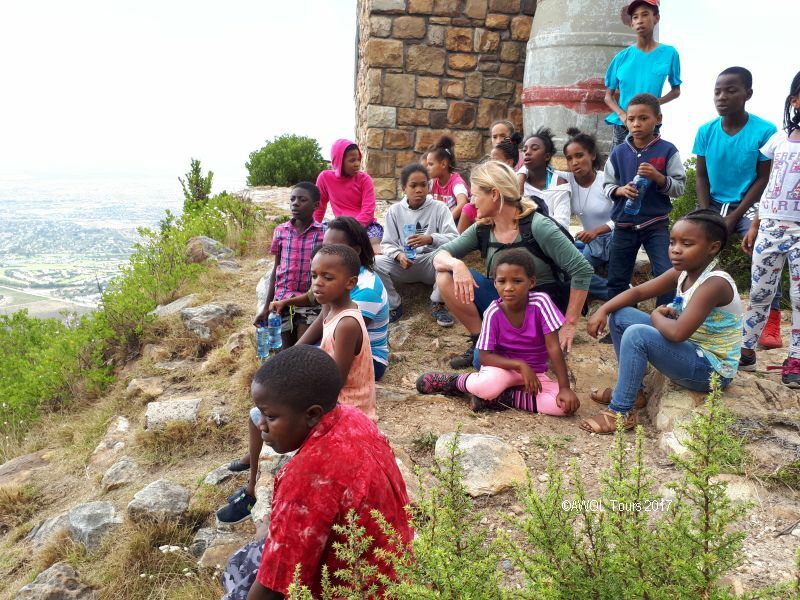 Through the Active Hearts foundation, I was asked to volunteer once a month to facilitate hikes for underprivileged township children (aged 6 to 12 years old) to experience the beauty of their own city, Cape Town. 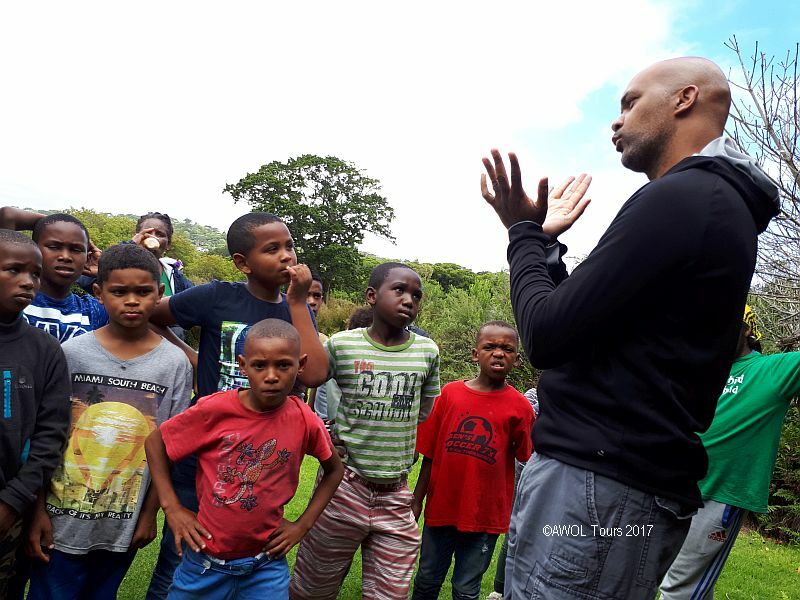 My two adopted children are of a similar age and I thought this would be a wonderful opportunity for not only for me to share my knowledge and passion of the nature in Cape Town but for my children to also engage and interact with children of a similar Khoisan cultural background. Once a month, I organise a suitable hiking trail that is not too challenging for pre-teen children. I then first have to trail run to blaze out the trail, negotiate with the land owner such as SANParks or Kirstenbosch to get permission, and then organise AWOL Tours-sponsored transport and lunch. Many of the children don’t eat descent balanced meals at home so it’s important that we have lots of nutritious snacks to keep little bodies energized. The first time I met the group of kids, I had to bite back the tears as I saw how scantly dressed they were; many weren’t wearing descent shoes (in some cases no shoes) in comparison to my kids who were wearing their sturdy K-Way hiking boots. As a result, I’ve gotten hordes of school friends to donate old trainers so the kids can hike without injury. Cape Town has so many varied and adventurous places for younger kids to hike. To date we have taken the Westlake kids on a hike to Elephants Eye cave in Silvermine , Boomslang cave in Kalk Bay, Peers Cave in Noordhoek, Shipwreck trail at Cape Point, and the Cecilia Waterfalls. Our latest outing took us on a walk through Kirstenbosch botanical garden. Yesterday we had our year end Christmas picnic party in the Kirstenbosch Botanical Garden. Many friends contributed in different ways to make the day a massive success. A wedding couple kindly asked guests to purchase and donate Christmas gifts for the Westlake kids instead of wedding gifts . 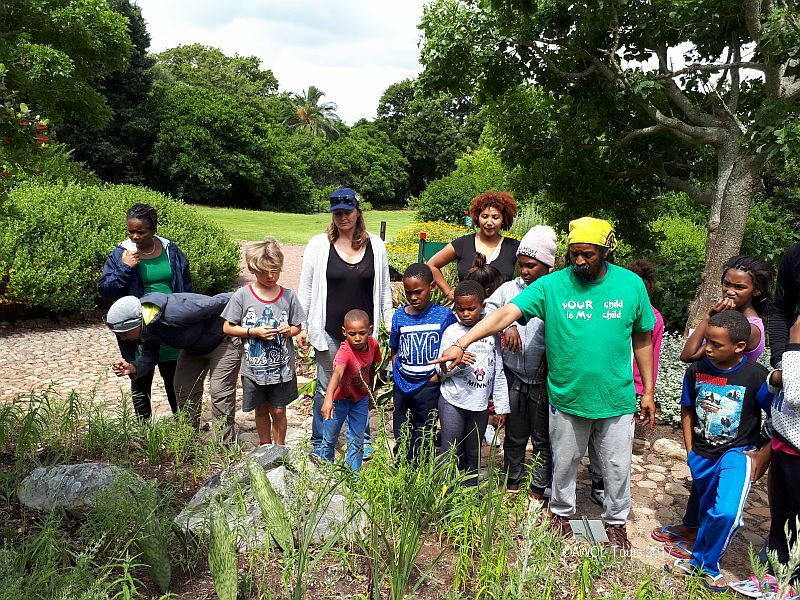 Its absolutely wonderful that my crazy AWOL colleagues and friends have gotten on board with my vision to educate and engage with the Westlake kids through nature. Hiking on Table Mountain is such a wonderful way to uplift and educate disadvantaged children. 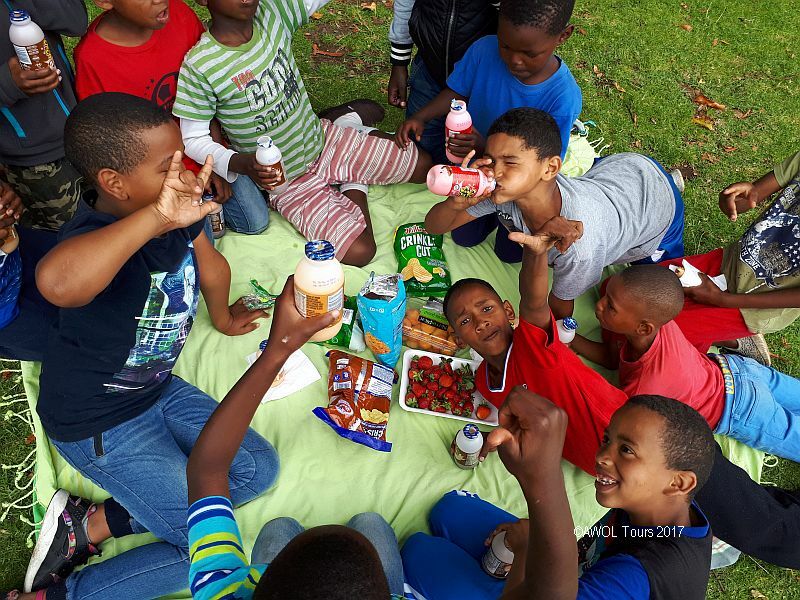 It costs approximately R100 per child for food, transport and entrance fees to participate on an outing. AWOL guests are welcome to join on these community hikes and can sponsor a child to get out of the informal settlements and to experience the beauty of Table Moutain in the backyard of there own city.